This follows Parts One and Two. 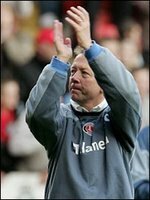 I was like most fans disappointed to see Richard Murray appoint Curbs over Gritty, Gritt was a legend and even though Curbishley had a Charlton pedigree, he was ‘more West Ham’ in my eyes than Charlton. Bit like Pardew could be considered ‘more Palace’, even though he played more games for us. The two-man pairing of course was never made to last, they never are – look at Wham! But I was content to support Richard Murray and the board’s decision. That first season was an enjoyable one, with a couple of good cup runs – who remember’s Bowyer’s hat-trick away at Wimbledon on a Tuesday night at Selhurst? – We also made the play-off’s losing unfortunately to Palarse but it was a start and honestly that season we were nowhere near ready for promotion. Nonetheless it was disappointing and I remember at that 2nd leg being confused by Curbs not playing either David Whyte or Bradley Allen that night, two potential match winners. It wouldn’t end up being the first time I despaired at his team sheets or substitutions. Even so, in that first season under his sole charge he’d given us all a taste and a belief that we could get out of the division. The next season was one of rebuilding with Bowyer sold to Leeds and in May of 1997 the signing of a certain Clive Mendonca signalled some real intent to give promotion a go. Crowds were on the up, The Valley’s development made the weeds on the terraces a memory and relative star names were being persuaded to join the ranks – such as Eddie Youds, Mark Bright, Mark Bowen, Steve Jones and Danny Mills. Of course that season ended with the Wembley play-off final and one of the best, if not the best and most exhausting day of my life and although Lawrence in many ways achieved more by taking us up the time before, this time I felt that Charlton got the plaudits they deserved with non-Charlton people in admiration and Curbishley had a lot to do with that. In those years Curbs bought a certain player, something he has always made a point of saying, although I would argue that he strayed from his mantra with some his final signings for us and these combined with Dowie’s mercenaries, the current line up would run for hills when faced with some of the players that Curbs had in his squad in the mid to late 90’s – Youds, Rufus, Balmer, Bowen, Bright, Mills, Kinsella, Brown and Robinson as well as a young Konchesky, Parker and Kevin Nicholls, who all wore their hearts on their sleeves and played as if every game was their last. We lived the dream that first Premiership season, with wide eyes I went to all the big grounds and was just happy to be there or see us on the box, or read big reports in the papers and despite Stevie Brown’s heroics at Villa Park, no win in our last 6 home games was enough for us to get relegated at the first attempt. In my mind it was the next summer, when Curbs pulled off some of his best managerial decisions. He persuaded Kinsella, Mendonca and Powell all to stay, sold Danny Mills for very good money and struck early by signing one of the best goalkeepers outside the Prem, Dean Kiely. It was one of my most enjoyable seasons. Up until Easter, in a harbinger of what was to come, Curbishley’s team walked the league. I’m a pessimist when it comes to Charlton generally but that season I woke every match-day thinking that we would win. A week before Easter on-loan Paul Kitson’s late winner at Sellout (our first win against Palarse there in 75 years) had us all believing. The real shame was that we had to limp over the line because after our Good Friday win at home to QPR a 110 points total did not look beyond us but that was to be our last victory of the season. 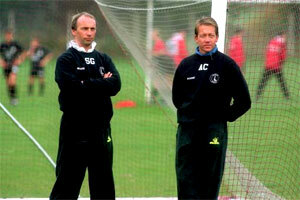 One thing Curbishley was in his time at Charlton was prepared. His coaching and his analysis of opponents and their players was down to the smallest detail and this trickled throughout the club and that first season back in the Premiership we were a different proposition to the fish-out-of-water one two seasons previous. We had that battling spirit and confidence that took us to the title the year before plus players with experience of the top level and we had players that could play – it was no surprise the then midfielders of Jenson, Stuart, Parker, Kinsella, Robinson, Newton and Kishishev all went on to have good Premiership careers. The next few seasons were one of growth. 40 point targets, improving the squad with players that were better that what we had, The Valley was improving as were the pies, the crowds were getting bigger, nothing for those big clubs to get excited about but a nice way to run a business and nice time to be an Addick and for once we were able to show off about our little club, which was run sensibly, and encourage others to come and have a look at our success story. I remember being chuffed when Curbs denounced West Ham’s approach in May 2001, Big Brian Cole putting him on the spot after the last game of the season. But although Curbishley was a planner, and one could never knock his record over the course of a season, there were times during individual games when I just hoped for a bit more courage or invention, things started to get a bit dull frankly – call me spoilt if you like. We were on the cusp on moving to become an established top half club and I felt that we should have been more adventurous in games. Curbs’ teams nearly always beat their relegation ‘rivals’ by grinding out results but in games when some flair would not have gone amiss, we rarely delivered, and when we did – Man Utd 3-3, Chelsea 4-2, Arsenal 4-2, Liverpool 3-2, they were treasured moments. Everyone we signed seemed to be a utility player and if he did sign a creative one, he seemed to curb them, if you pardon the pun, and saddle them with duties that clearly were not in their games. The big turning point was in January 2004 when Parker spat his dummy out and joined the bench-warming club at Stamford Bridge. Curbs’ was fuming and maybe it was at that point he realized that we were truly punching way above our weight. He never replaced Parker although the signing of Murphy and Smertin were both players who could have taken us to the next level, but to me Curbs showed that he could not deal with so-called star names. Rightly or wrongly, these players need pampering and ego stroking and a certain amount of freedom within the confines of a club but it was Curbishley’s club, no one else’s and no one got in his way, not Murphy, not Euell, not Konchesky, not Andy Todd. Di Canio’s signing was inspirational but they were to be in short supply as Alan struggled to move both the club and himself onto the next level. The England job was unsettling and it would have been a fitting way for him to leave The Valley but he and we knew it was never going to happen. Reputations are taken into account during these things and Curbs’ didn’t have the right one for the head-up-their-own-backsides knobs at The FA. So, it came to an end. We never did get that Cup run and we depressingly finished every season after we reached the magic 40 points, despite the club telling us that we wanted to push on. However that day, even sat at home now living in Chicago, against Blackburn and the spontaneous applause that rang around the ground during the last 5 minutes will always be remembered. He never really was a Charlton man, the fans rarely sung his name, but what he was, was everything that Charlton stood for during those 20+ years he was with the club, through some of the darkest to some of the finest moments. We should always be proud that we had a man like Alan Curbishley leading us during those times but as people used to say we will never know how good he was until he is gone. That may well be the case but believe me Curbs is not blameless for the demise that was coming.